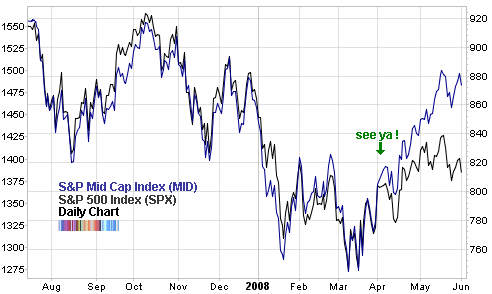 In early April, around the time the stock market recovered from the March bottom, suddenly the Mid Caps (right axis) and the Large Caps (left axis) parted ways. This is rather strange because they walked hand in hand for a very long time. I’m not sure why exactly. Even more puzzling, the S&P 400 Mid Capitalization Index (MID) also outperformed the S&P 600 Small Cap Index (SML) - not shown on chart. Any ideas why the Mid Caps are hitting the sweet spot now? 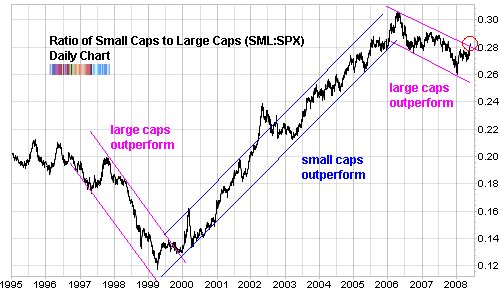 The market does tend to go through drawn out cycles when the large caps and the small caps take turns leading. Some of the most successful Mid Caps become Large Caps. So many companies appear on all the sweet spots in all the charts. So these charts may be showing a historic economic cycle of a core group of companies having massive success becoming large caps (ie. technology companies). Sitting on MDY since 2000 would have been a good growth stock investment. Paul, that’s quite an insight. 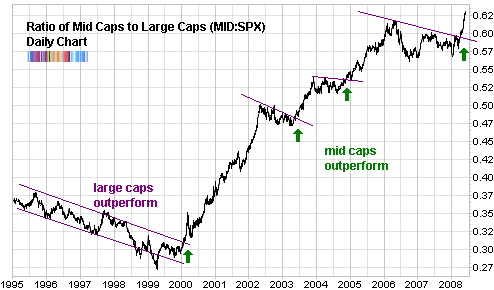 You think maybe the midcaps are large enough to be able to hit momentum and small enough to still have room to grow? could be something to that. Although, according to most data I’ve read the small caps represent the best return for risk over the long term. But that’s over a really long time, and the graph shows less than 15 years.